When I think of Valentine’s Day, I don’t think of fancy dinners, champagne toasts, flowers, or candlelight. Oh, I’ve experienced those moments a time or two, but most of my memories are of last-minute scrambling to complete Valentine cards (one for everyone on the list…yes, even the dorky kids) and frantically baking for class parties. In my next life I’ll be wined and dined. In this one, it’s okay that romance took second place to cookies and cupcakes! If you’ve never made an angel food cake from scratch, now’s the time. It really isn’t hard at all. And you don’t have to bake it in a tube pan…cupcakes or loaf pans work very well. Here’s the recipe I used for these pretty little cakes: If you don’t have superfine sugar, you can put sugar in a blender and blend it briefly. The goal is to make very fine sugar, NOT powdered sugar! This is one of those recipes where you do actually have to follow rules. Sorry. That means room temperature eggs, careful measuring, thorough sifting, gentle folding. It’s all about getting a light, airy texture – worth the extra effort, right? Finely dice the maraschino cherries. Roll them in a couple of layers of paper towel and press to remove as much of the juice as possible. Set aside the cherries and chocolate - those will get folded into the batter last. Sift flour 3 times with ½ cup of the sugar into a small bowl. Beat the egg whites until foamy. Sprinkle the salt and cream of tartar over eggs and beat until they hold soft peaks. Add the rest of the sugar, ¼ cup at a time, beating thoroughly after each addition. Stir in the vanilla. Add the flour mixture in three additions, folding gently each time with a large metal spoon. Fold in the chocolate and cherries, being careful not to stir. You don't want to lose any of those precious bubbles! Spoon into cupcake liners, ⅔ full. Bake bite-size cakes for about 20 minutes. Bake regular cupcakes for 30-35 minutes, or until golden brown. Fold the flour into the egg and sugar mixture. Bake to a light golden brown. I like a dollop of whipped cream on my angel food cake, but it’s not very practical unless you’re serving dessert immediately. So I used a marshmallow-type frosting. It is very soft and fluffy when you are working with it, and then it firms up to more of a soft marshmallow texture. Not too sweet – perfect for these cupcakes. Here’s the recipe. Red or pink food coloring, if desired. In medium bowl, beat egg whites, salt, and vanilla at medium speed until foamy. Gradually add sugar, 1 tablespoon at a time, beating at high speed until soft peaks form and sugar is dissolved. In a small saucepan over medium heat, bring corn syrup just to a boil. Holding pan high above egg mixture, pour in a very thin stream, beating at highest speed until frosting is thick. Blend in food coloring, if desired. I piped melted chocolate onto waxed paper, making little heart shapes for decorating. You could also use sprinkles or Valentine’s candy. 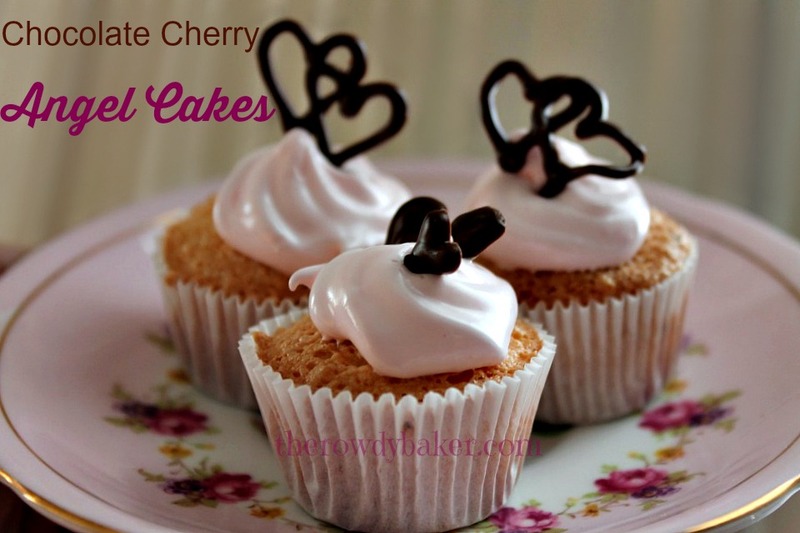 If you’re making the larger cupcakes, a chocolate covered cherry on the top would be lovely! This recipe makes a lot of cupcakes. Take one to a neighbor or a shut-in; everyone needs a little love! This entry was posted in Cakes, Holidays by Lorinda. Bookmark the permalink. Oh my gracious, they look awesome! Pinned this for future reference! Thank you! The problem with these is, you don’t feel like you ate anything substantial. So before you know it, they disappear! Gone! I’m thankful that they’re low fat, at least. Almost NO fat. Whew.